Kulfi is the traditional ice cream of India, made by boiling milk until it reduces and condenses, then flavouring it with pistachios, cardamom and rose–water and set in a special conical mould. To serve, the ice cream is cut into a deep cross. On special occasions, it is decorated with a gold or silver leaf. Below is YTF member and Founder of Taste Cafe in Pretoria, Willie Cloete’s take on this heavenly treat. Mix the cornflour with the milk and set aside. In a saucepan, heat the evaporated milk and bring to the boil. Add the condensed milk, coconut cream and the cornflour mixture. Stir well for one minute. Remove from the heat. Allow to cool. Add the rosewater once cooled. Place the creamy mixture in a food processor and blend for a couple of minutes or use a hand-held blender to whiz the mixture. Pour into a plastic container with a lid and freeze for at least six hours or overnight until the ice cream is quite firm. If you have an Ice Cream machine, cool the mixture overnight in the fridge. The next morning pour the cold mixture into your Ice Cream Michine and churn it until smooth and frozen. 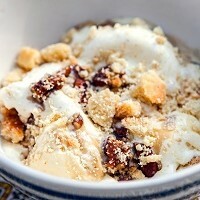 Serve it with chopped salted pecan nuts and crushed shortbread. Chef’s Tip: Replace the rosewater with honey for a honey flavoured kulfi, or 40ml strong espresso for a coffee kulfi! This is the base recipe and you can add whatever you want to. Enjoy and have fun!